Arriving from Kentucky with only $19 to his name, Frank Vessels Sr. built a fortune in the construction industry, and eventually purchased a 435-acre ranch in Orange County. 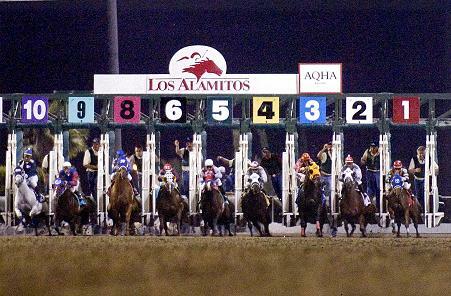 Racing at what is today Los Alamitos started off as match races contested on the Vessels Ranch in 1947. Until the 1990's, the Vessels Family had always owned Los Alamitos. However, the 1980's proved a time of great change, as the track passed from one owner to another. Finally, When Los Alamitos was put up for sale in 1990, Allred was able to acquire 50 per cent ownership, with help from RD Hubbard. 1995 saw the opening of the $5 million Vessels Club, the lavish turf club restaurant which has gained fame for the decor and food alike. The Vessels Club has even been named the top sports park restaurant in Southern California. In addition to the Vessels Club, the track has also opened such fan favorites as the Player's Club, Rodney's Bar (named after trainer Rodney Hart) and Schwanie's Grill (named for trainer Blane Schvaneveldt) under Dr. Allred's tenure. 1995 also saw the beginnings of the Los Alamitos $2 Million, a championship race for two year olds. The 2008 running was the richest non-Breeder's Cup race ever contested in California with a purse of $2,038,250. It is also the only quarter horse race in the country with a guaranteed $2,000,000 purse. Los Alamitos also offers the richest three year old quarter horse race in the country, the Los Alamitos Super Derby.